Our foraging trip last weekend was just so nice. It was just great being away from the city for a few hours. I am always amazed by the marvellous goodies we find when we start looking out a bit more. It makes me think about how much we miss day to day, zoned out in our own little worlds. We came across crab apples, watercress, wild cherries, pineapple camomile, orange birch bolete, sweet cicely, rosehips, hawthorn and wild strawberries. Our main bounty, however, was lots of ruby red wild raspberries. These are smaller and slightly more tart and intense than commercially grown raspberries which of course you could use in this recipe instead. “Glen ample” is a wonderful raspberry variety – large and plump with a pleasant acidity. It is widely available in different supermarkets. 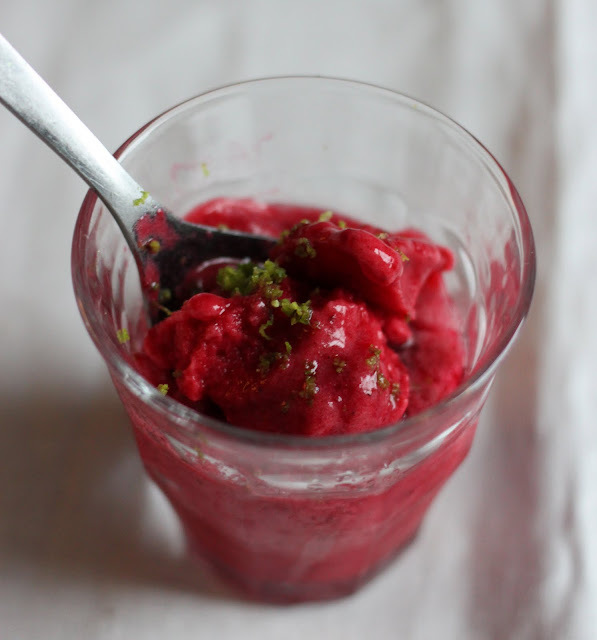 This recipe makes an intense sorbet which really is very quick and painless to make, taking about 20 minutes from beginning to eating. I served it in a little glass with a wee hit of vodka and some lime zest. This recipe works on proportions, 4 parts fruit to 1 part sugar, so whatever quantity of fruit you find/buy you can enjoy it in sorbet form. Mash the raspberries through a sieve with a bowl underneath to catch the puree. Discard the pips (unless you are more inventive than me and have a great use for them). Add the icing sugar to the raspberry puree and mix. Have a taste, you may wish to add more sugar. Pour into an ice cream maker. Leave to churn until the required consistency is achieved. I need to get an ice cream maker so I can try this delicious recipe! Fab! Raspberries look beautiful and gorgeous shot of the shorbet. What a beautiful, simple recipe! I've just been given an ice cream maker for my birthday so loving anything frozen. ps I have those glasses too! Beautiful and certainly luscious sorbet! You are so lucky to find all these treasures in the nature (not possible everywhere in Europe...). If I had an ice-cream maker I would try it. I love adding a splash of alcohol to fruit desserts, jams, sauces... It always makes the taste sharper and more elegant. Your sorbet reminds me of my "almost sorbet" mousse made with peaches and gin. I have almost forgotten to say I like your blog very much!